The first and ultimate card (in the position of the World archetype) bids us to contemplate our Star, our Hope, our Faith in worlds unseen. The Virgin of the Soul is pouring forth her distillate, both onto the earth (the body) and the waters (the spirit). In this image we are admonished to return to the internal purity of our authentic, original natures, where we can again get in touch with our starry (astral) aspect again. Our civilization has totally forgotten that we are souls first and foremost, creatures of consciousness even before we are creatures of action. By valuing and rewarding action, acquisition and consumption over wisdom and peace, modernity has impoverished us and is quickly reducing our world to ashes. Enlightened self-interest dictates that in an absence of leadership from without, the survivor reaches for leadership within. Call it what you will, the Star card represents that "still small voice", the "point of light at the end of the tunnel", our connection to what is oldest and best within us (in the words of Harold Bloom). Some will hold it outside themselves, as a Holy Guardian Angel, but esotericism holds that this aspect is an integral part of the self just as surely and presently as the body or the ego are. Tradition points to the Light Body as the main referent for the Star card, a teaching that has had resonance for every civilization that has seriously contemplated the category. At the root of all the Abrahamic religions, the Light Body came to us from Zoroastrianism, also the source for most of the tradition of Angels in the west. It is part of the oldest teachings we have about the energetic constitution of humanity. 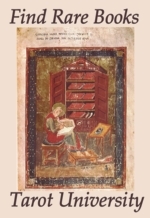 Therefore, no particular religious or philosophical model is required to access it. Simply allow yourself to recognize its existence, and the hookup is consummated. Shifting one's center of gravity from the physical body to the Light Body is a major initiation-point in any chain of incarnations. This is the point where the soul seals its fate eternally, becoming committed to regaining its enlightenment and immortality. From here on out in the Trump cycle, all forces of resistance begin to drop away. Notice that no change in outer circumstances is necessary for this shift of center to take place. It's all going on here/now; it’s all independent of the material context or temporal matrix. This is an act of self-empowerment taken in the innermost reaches of one's own awareness, in the total and true privacy of one's own Ground of Being. My hunch about the reversal of this card is that it represents a warning -- as in, seize this goal and don't let go! One has to want the shift, truly desire it and long after it, be focused in intent and unswerving of will, in order to accomplish this most subtle but most transformative of acts. Distractions abound, and for every minute in the day there is another reason to put these kinds of thoughts on the back burner one more time. We have been forgetful so long, about so many things we are ignoring, that the habit has begun to seem normal and rational, the same way people rationalize overeating or smoking. For whatever reason World Servers, wherever we are, are being admonished not to slip back under the waters of Lethe, but instead rouse ourselves and grab onto these ideas like you would a lifeline. 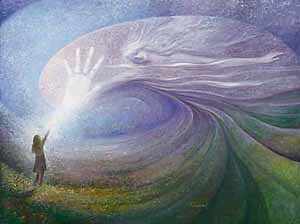 Be Awake In Your Light Body! Whoever can hear this, let them take this advice to heart. 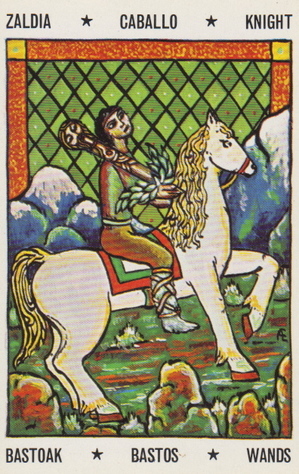 The penultimate card, in the Fool position of our World Server's spread, is the Horseman or Knight of Wands. His traditional word-concept is Embarking, taking the first steps of a journey in a new direction. For some reason, my thoughts on this card in this slot go to the movie Groundhog Day. Remember that? The reporter played by the incomparable Bill Murray wakes up every morning in the very same calendar day, having to do everything the same over and over till he gets it right. 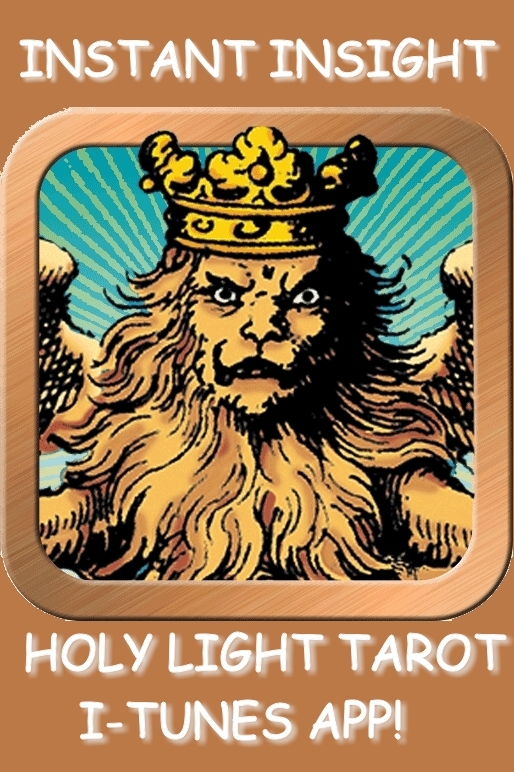 This is how I am seeing the Knight of Wands embarking in the Fool position. Like the weighted blow-up clown that pops back up every time you knock it down, this card counsels perseverance in starting. There is no telling how many times one will be called to "pick myself up, brush myself off, and start all over again". It is said that it takes 18 to 26 repetitions of a behavior before it becomes a habit, so we have to be stubborn enough to outlast the resistance that change always induces. In the fairytale canon there are many stories, which take up right at the point that a simpleton steps in to accomplish a task that the ordinary heroes have already failed to fulfill. By trying a fresh approach, s/he can resolve the problem that reflex action could not fathom. Any soul who undertakes this kind of task runs the risk of being teased as a fool before finally earning the title of hero. The worthy cause demands multiple fresh starts, and nothing less will do. 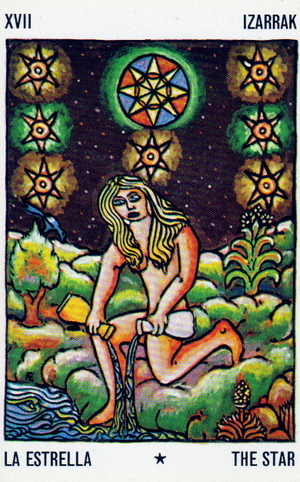 Whoever has the stamina, will, and vision to impose the new order rather than just fantasizing about it or retreating in the face of the naysayers, will win the wand of power decked with the laurel bough, as shown on this card. Collectively there's a great need for heroes of the everyday kind, so everyone should be able to find an application for this configuration in their current lives. The third card is the Three of Swords reversed in the Magus position. This card gave me chills when I first saw it, and not just because one of its common meanings in divinatory Tarot is "divorce". A more substantial locution often attributed to this card is "failure of communication". 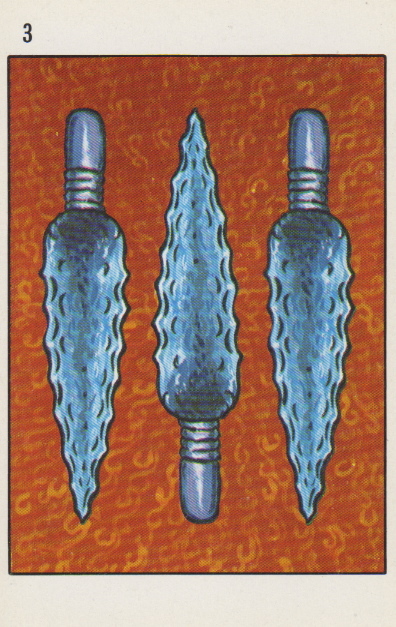 Even though the number three has the aptitude to be a benign influence in many situations, the overlay of the suit of swords has stained the positive associations with a stressful and grievous imprint. Argument, misunderstanding, and accusation prevail, and knives are flying in all directions. This looks to me like a losing proposition all around. Whatever part of our individual selves has in the past gained self-esteem from controlling the dialogue, will soon have its complacency shattered. One of the earliest formulae I learned for this card is "tear the blanket", meaning, divide everything down the middle and go your separate ways. Cut your losses and get out now, that's the message -- the situation is non-sustainable and non-negotiable, period. Because this card is also reversed, it brings up the implication that the real site of the split is internal, even if the symptoms of the problem are appearing between the self and one or more others. To the extent that we are each harboring false "shoulds" that oppress us, we create relationships that mirror those same limits back to us, triggering rebelliousness, anger, hurt and depression. Most of us cannot help but pick our friends and lovers in ways that restimulate our primordial dilemma, so there is no use in trying to ask for changes from the very characters we have hand-picked to fit into our predetermined roles! Therefore this card, turned inwards like it is, bids us start pruning away at the expectations we hold out for others, and begin the harder work of taking back our projections and assuming more responsibility for managing our expectations realistically. For example, it doesn't matter what another person says, or how convincing they are, or how many times they perform their words of power in your presence. Words themselves never have, never will make a thing true or untrue. The thing that people actually do is what matters, what is real. This includes factors like where they spend their time, their money, and their emotional investment from one day to the next. People vote with their feet, so there's never a need to listen to excuses or elaborate justifications. The Three of Swords notes any gap between words and deeds, and then cuts off all unproductive channels of exchange. This card chooses golden silence rather than constant massaging of the message, because it has too good an ear for the weaseling of parsed truth. Some might say terminating relations is an antisocial impulse, that it's not compassionate, that it assumes the worst without bothering to hear all the mitigating arguments. Nevertheless, this card implies that such considerations are just the problem trying to talk you out of solving it. Hear this in your own inner voice -- it's time to behave like a warrior. Cauterize your wounds and move on. The situation didn't work out, and now its time is past, so move along and don't look back. Quit bleeding out energy towards an irresolvable dilemma and admit to yourself that you don't have time for this. To summarize this short but potent spread, we are being abjured to seize upon our personal quotient of Light and inspiration, and hold onto it with our whole heart and will. Strive to shape your individual private live to more accurately embody our own unique heroic impulse, to resist the passive and active distractions that tempt us and split our attention, so we can confine our efforts of will and consciousness to that territory most likely to create progress and admit an opening towards fresh potentials. We do not need to bring anybody else along with us when the goal is pursuit of our own Celestial Mandate. Let's each gather up our personal motivation and set out on the path of our soul's own destiny. By cutting cords to less-useful identifications and non-nourishing relationships, we free up energy to devote to the Quest, and to the restoration of our hope and vision of a better future. the 3 of sw just happened in my life - almost EXACTLY as you've written Christine! this was w/ respect to a "less than honest" store owner, for whom i'd worked 14 hrs [and been paid for less than 6], pd at a lower rate than agreed upon, not paid for 2 original designs and over 3 wks dedicated creative work!! [these all in my knitting incarnation - sabian "native american woman selling her handmade artifacts"]. a close friend has a very close chart to mine, especially with my progressed sun on her ascendant, and is going through an identical dilemma. What I have noticed over the years is that the three of swords is the antidote to the eight of cups. In saying that I mean we have to learn to be fierce with ourselves, to say our difficult truths clearly and without hesitation, in the moment when the issues are pressing, or we will repeatedly find ourselves in positions where we feel victimized. Many people, especially women with a certain kind of acculturation, won't speak up when their toes are being stepped on, when they are getting screwed by someone more balls-y or insensitive than they. We forget that the "implied social contract" (the unspoken rule to treat others as you would like to be treated) is only binding on people with a conscience. Plenty of folks move through their lives without a single compunction about such niceties! So even though the three of swords always hits me like a splash of ice water, I am learning to welcome it into consciousness and give it a place in my thinking. There are only 24 hours in a day after all! We don't want to waste a minute in relationships where we ourselves are second-class citizens. solstice reading the world server's spread. man in the white house... they actually said "impeach" on the news 2 days ago. i do pray for the health of gwb, as it'd be serious loss of all liberty, environment, and worse if cheney got into office. them manifest was also shown by the last minute failure of sneaky alaska oil provisions added to a bill... what a great gift to know at least this one good thing has happened today!